Scroll down to view several of the various imaging platforms I am using. Setting up in the house gives me the ability to balance each system and practice my routines. Everything is much more difficult in the dark and cold of night. 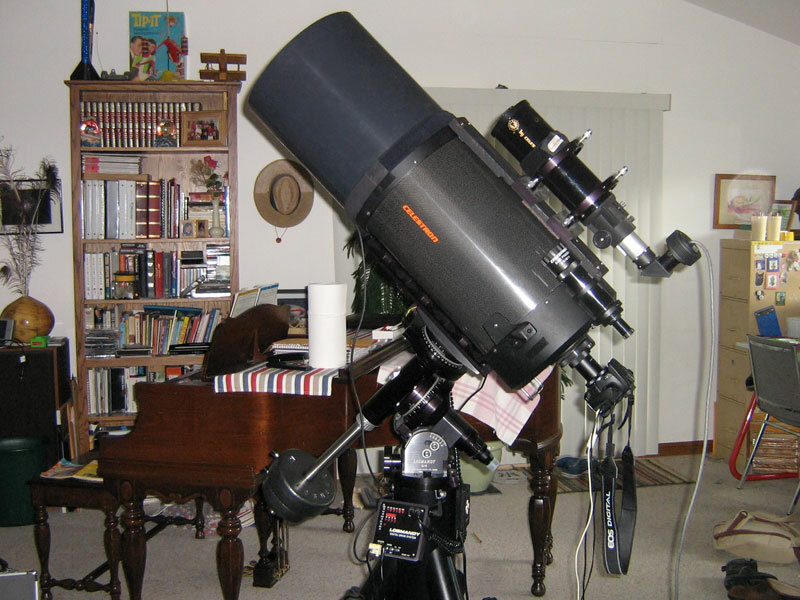 Pictured above is my Celestron 11" SCT, (Schmidt-Cassegrain Telescope). I use this set up for targets requiring long focal length. 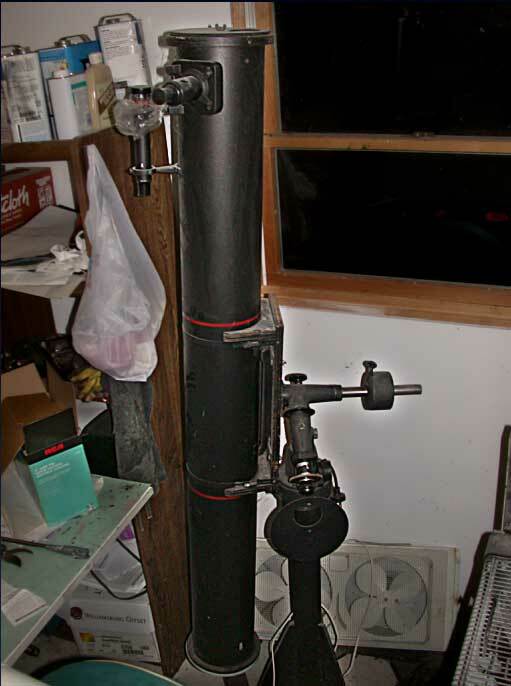 The same C11 optical tube can be placed on it's original NextStar 11 fork mount. Since it is a "go to" mount, it can be operated remotely from in the house during cold weather. Here it is shown ready to image planets. 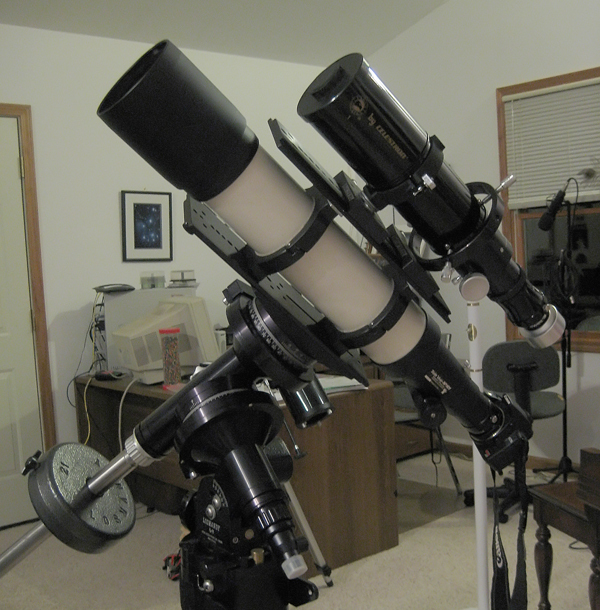 This is my 10" f/4.7 Newtonian on the same equatorial mount a Losmandy G11. This beast though larger in size affords slightly less focal length than the C11. Most of the wider field deep space objects in the gallery section were imaged with an 8" f/4 R200SS Newtonian. Having sold it to buy other equipment, I couldn't do without an 8" f/4 in my arsenal. Shown here is my newly acquired GSO product. It is surprisingly well built at one third the cost of the R200SS. Note the dual speed Crayford style focuser. Unlike the R200SS, it needed some modifications for use as an imaging scope. Longer collimation screws were added to bring it to focus with my camera. Provision was also made to mount the guide scope on top of the rings. With the addition of a coma corrector, that's all the mods necessary to convert this inherently fast but cheap optic to a virtual astrograph! I have yet to put this new one thru the paces, but initial star tests indicate a very good primary mirror figure. Evidently GSO tries to make every one this way. Another OTA that I am looking forward to using more, is a TeleVue NP101. It too mounts on the G11. The scope on top is my ST-80 used for guiding. At 540mm & f5.4 the NP101 will offer a wider field than the 800mm f/4 Newt. The NP's Nagler-Petzval optical configuration provides excellent field correction and is completely free of chromatic abberation. My main DSO camera is a modified Canon 350D. The internal filter has been replaced with a type I astronomical filter which allows greater H-alpha sensitivity. It is shown here with all the hardware needed to to control it from a laptop. 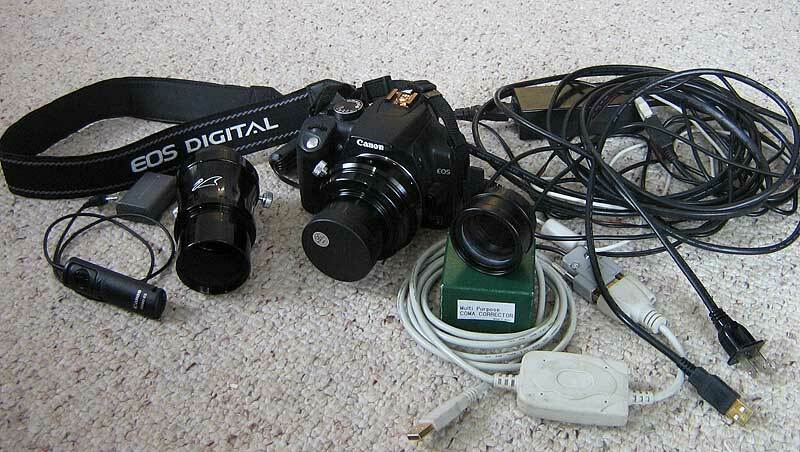 Various camera lenses, (not shown) are used for wider field astrophotography. My main lens is a Sigma 70-300mm F4-5.6 APO DG Macro. In the picture, the camera is attached to the a field flattener lens. To it's left is a Baader coma corrector for the f/4 Newt. To the right is an extension tube. All will fit in the draw tube of a telescope for imaging. The above ST-4 camera is used as an autoguider. It monitors a star and sends guide corrections to the tracking mount as needed. 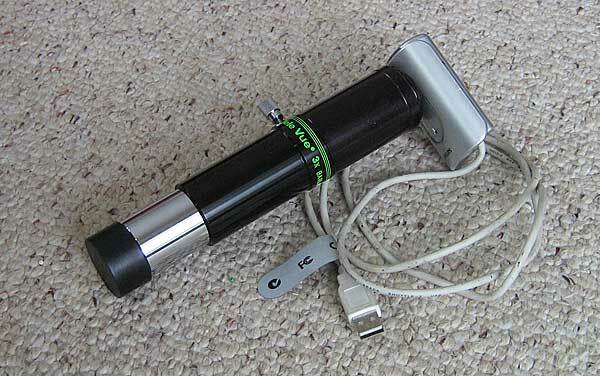 It can be attached to the guide scope as seen in some of the scope pics above. 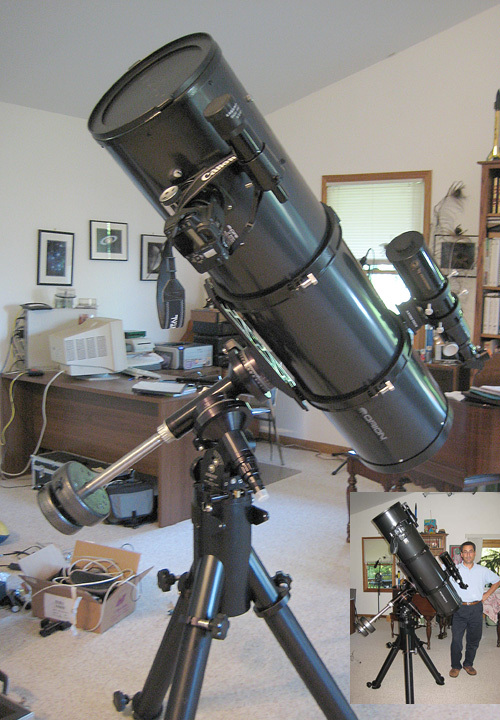 My planetary camera is a Philips ToUcam ProII, shown above with a TeleVue 3x barlow and extension tube ready to image Saturn. 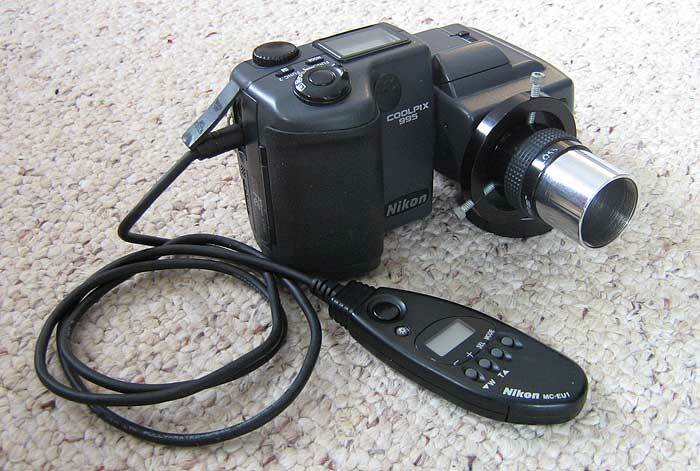 Another camera that I still use occasionally for planetary work is the Nikon CP995. Here it is shown attached afocally to an eyepiece, ready to attach to a scope for quick and easy pictures. 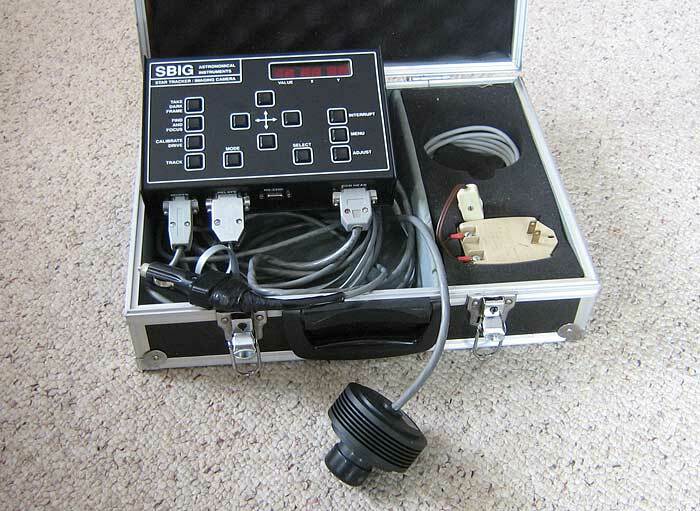 Last but not least is the scope that started me into astronomy many years ago as a teenager. 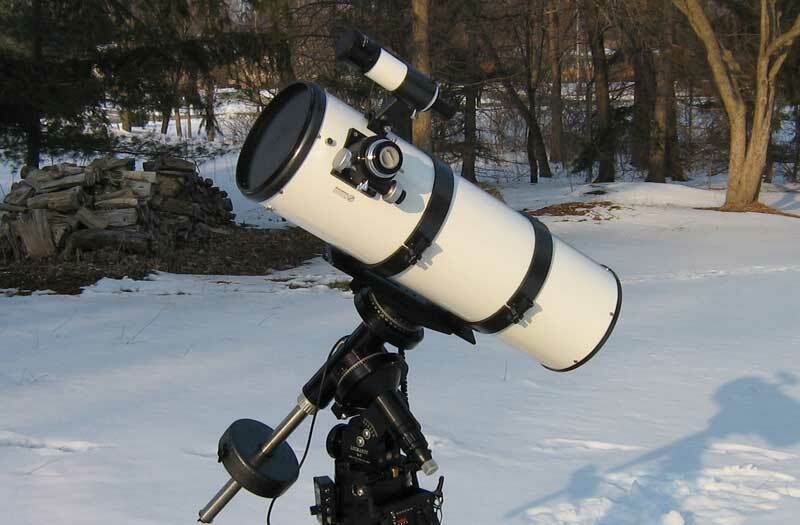 It is a home built 6" f/12 Newtonian... not very good for astrophotography but an excellent optic. It is on an older German equatorial mount with clock drive, gathering dust in the corner of a messy garage.